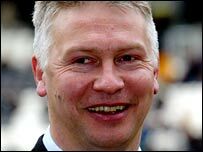 New chairman Adam Pearson has promised to hand Derby boss Billy Davies a cash injection to keep the Premier League's bottom-placed team in the top flight. The former Hull chief will run the club on a day-to-day basis in place of out-going chairman Peter Gadsby. He said: "The board and I will continue to offer Billy full support in our quest to remain in the Premier League. "We will be exploring all possible options available to ensure a successful transfer window in January." Davies' side are on a miserable run of one win in 11 league matches, but Pearson believes the former Preston boss is still the right man to lead to club out of trouble. He added: "We firmly believe we have the manager and backroom team in place to continue the remarkable progress achieved on the pitch by Billy and his squad over the last 18 months." Since leaving Hull, Pearson had been linked with Leeds, where he was once commercial director, Notts County and Huddersfield. But Gadsby, who played a key role in turning the club around after the present board inherited debts of around £54million 18 months ago, said: "I want to make clear is that Adam joining the club does not represent a takeover of Derby County. "But we wanted to introduce someone who can take us forward in running the club. "Adam was prepared to put in an investment of his own as a demonstration of his commitment to Derby County. "I was surprised by the levels of expectation of some of our fans, particularly over the club's perceived lack of investment in the playing squad just five games into the current season. "The board did not want to overstretch the club's finances and risk returning Derby County to the previous cycles of feast and famine. "This predicament led the board some weeks ago to consider how to take the club to the next level. "It was felt the time was right to seek further external finance that would enable us to compete, taking the opportunity to maximise the advantage created by our Premier League status and the security of parachute payments for the next few years."